I’m a weather person, I can’t help it. The light and the sun, the clouds and the rain have an impact on me (as for many others I presume). The autumn season have finally hit The Netherlands with rain and a bit lower temperatures (even though we have had the warmest October here ever according to the news). The darkness makes it tempting to stay inside, light some candles and eat real comfort food. So I do! Just so good for any moment of the day; at home, in your food box on your work or in the woods in your backpack. Warm or cold doesn’t matter. Simple, so filling, old-fashioned and sooo good! Below I give some examples of different fillings, maybe you also have a tip that you would like to share in the comments? 1. Add all ingredients to a high bowl and mix it with a hand blender until smooth. Let it the mixture rest for 5 minutes. It will become a bit thicker. 2. After 5 minutes, mix it with the hand blender once more and repeat this every time you take from the mixture. 3. Add a teaspoon of coconut oil to skillet and let it melt. Add enough of the mixture so it cover the skillet. Turn the skillet a few times to get an even, thin layer of the mixture. 4. Keep the temperature low and arm yourself with patience. Don’t turn the pancakes too fast or they will break! 5. When golden baked on both sides, place the pancake on a big plate to cool off and repeat until you have a stack of pancakes. 6. When done, enjoy the thin pancakes with whipped cream, clotted cream, Philadelphia cheese and cinnamon or sugar-free jam or fill them with a more savory filling (see recipe below). 1. Add butter to a big skillet. Peel and slice the onions (not to thin) and add them to the butter. Slowly bake the onions on a very low heat for about 10 minutes. They should just get soft but with no color. Turn and toss every now and then with a wooden spatula. 2. While baking the onions, brush to clean the mushrooms and slice them. After =/- 10 minutes, add the sliced mushrooms to the skillet. Continue baking on a low temperature until everything is soft. 3. Add the cream, tamari and pepper and let it simmer to thicken for some minutes. Time to assemble the pancake! 1. Set the temperature on 220º celsius. 2. Place a pancake on a cutting board. Take a tablespoon of the mushrooms and place it at the beginning of one side of the pancake. Roll up the pancake while keeping the filling inside. 3. Carefully place the filled pancake in a ovenproof dish and repeat filling pancakes until your dish full is. 4. 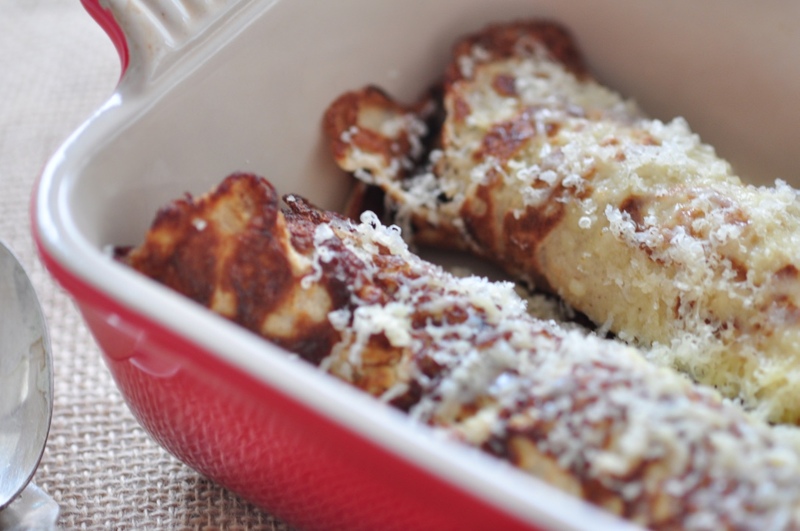 Cover the pancakes with grated cheese and place the dish with the pancakes in the oven. Bake until golden brown. Enjoy with a fresh salad! 1. Add butter to a big skillet. Slice the spring onions (not to thin) and dice the zucchini and tomatoes. Add them all to the butter. Slowly bake the vegetables on a low heat. They should just get soft but with no color. Turn and toss every now and then with a wooden spatula. 2. When soft, add the cream or crumbled feta cheese, chopped parsley and pepper and let it bake for some minutes. 3. Follow the instructions above for assembling the pancakes etc. Place the filling cold on each pancake and roll up. Place as above in a oven proof dish and cover with grated cheese. Place in the oven until golden. See that the chicken is really warm and the blue cheese is melted. Sprinkle some fresh lemon over when serving. Enjoy! Inspiring stuffed pancake instruction. I am intrigued but am wondering where to find this fiber husk ingredient. Is it the husk of a seed? We may call it by a different name here in the States. Beautiful blog, thanks! Thank you, how very kind of you! Fiber husk or Psyllium Husks as it is also called, can be bought via Iherb.com . More information about the ingredients you can find here; http://husk.dk/en/ . It is such a handy little thing if you like to cut your carbs and/or bake gluten free. Hope you manage to get it! Thanks Isabel. Now that I knoe that it is Psyllium Husks I’ll have no problem getting this and try stuffing some pancakes here in Seattle. Thanks! I’m very happy with your comment and have updated the recipe. Sometimes difficult with the product names! Thank you Kahryn, hope you will try it. It’s so good!